The singer: "More organ in the monitor?" The fan: "More Organ everywhere!" Such was the scene when the Vancouver quintet showcased their downcast pop in Montreal, a town that likes its melancholy in dancing shoes. Local openers Tremolo, whose live act veers towards a dub-inflected Radiohead, assured a stand-offish crowd that there would be dancing, and it came with Echo Kitty, the local buzz band who've earned an eager pack of fans (and one potential stalker) since their live debut only five months ago. Spilling infectious synth pop, the trio was decked in flounce-y naval wear, striking mildly choreographed, highly caffeinated poses along with their keys, guitars and drum pads. Ahoy! 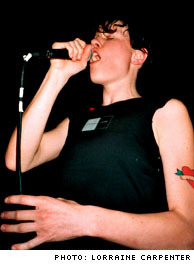 All that energy would seem hard to follow for the so-called melancholy misses of the Organ, but the quintet's lack of vigour was cancelled out by the cool sway of tunes from their Sinking Hearts EP and beyond, and the rich vocals and confident charisma of singer Katie Sketch, recalling the best of '80s Britpop. Logically, Brit-poppers, goths and Moz-squad guys took to it like a stoner to snacks, though none were more enthused than the little ladies of the closely cropped variety, who instigated a happy dance party down front. If this is what the Organ can create in its infancy, with one promising but imperfect EP and most of the band having just got the hang of their instruments, give them a year and they'll be great.